Your diamond stone jewellery will come with an authenticity certificate and this assures you the originality of the jewellery piece. Never purchase diamond stones, loose, or in jewellery, without this certificate as there is no guarantee about the clarity, cut and genuineness of the stone you purchase. 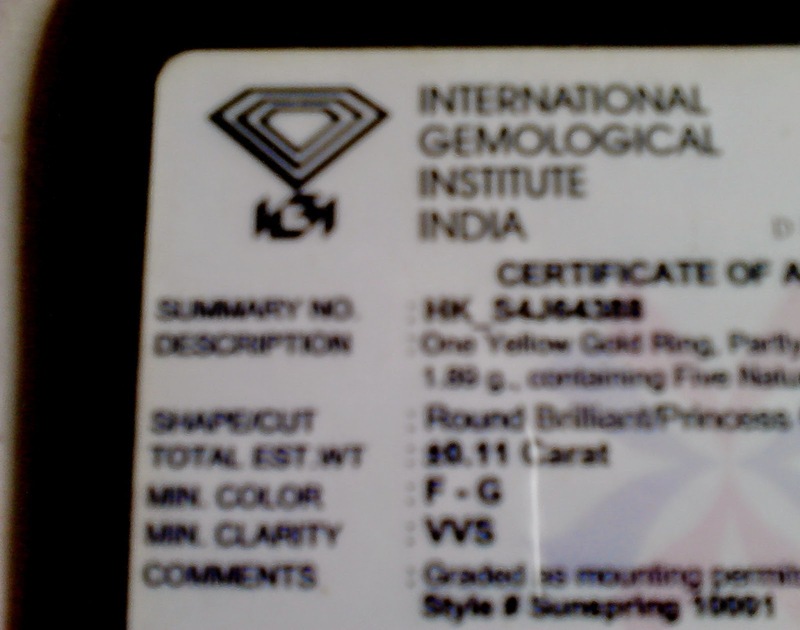 There are reputed gemological institutes that assess the stones and then certify them with a certificate. The diamonds are certified from gemology institutes here and abroad. International Gemological Institute India. DGLA another reputed gemological institution, Diamond & Gem Laboratories of America. Some private institutes also certify the stones which I have no experience of. There are our traditional jewelers who also bring up diamond stone jewellery but they only give their own shop bill and then the clarity or genuineness of the stone is on the reputation of the jeweller and your faith in them. The private jewellers bring out costly diamonds and we also do not get a certificate with this piece of stones studded in gold making it difficult to assess the value of the diamonds. Yes they assure you that you can sell it or exchange it from anywhere, but this becomes a problem as you loose out on a higher percentage while exchanging it form any other jeweller. For the lay person they just look likes sparkling stones in white and we just cannot assess its vale or understand the price ranges. Each certified diamond jewellery certificate has the details of the jewellery piece with the image photograph of the original piece you purchase. 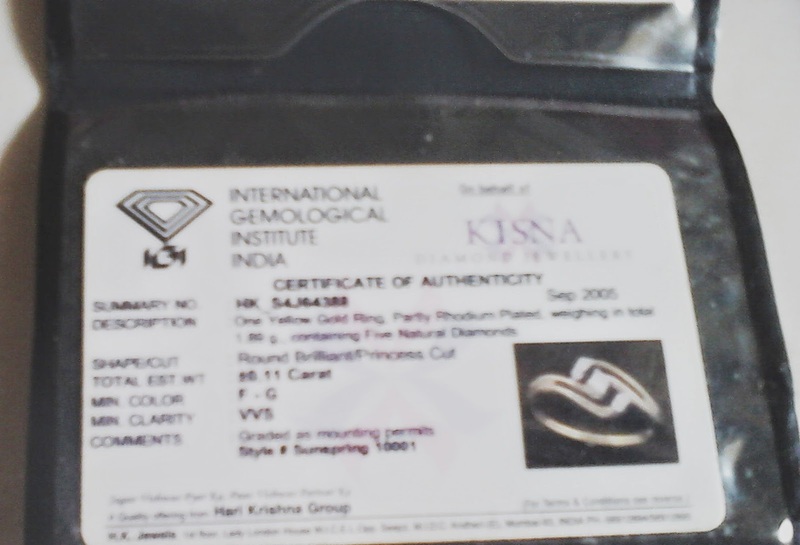 The certificate is a card which has details of the piece of diamond jewellery you buy. Each certification institute differs in this card but the details provided are according to certain criteria. Image, on one side you see details like certificate number. Then there is shape, it be round solitaire, cushion, square, diamond shape, princess, marquise, etc. 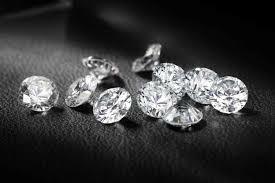 Then there are also some pieces with many small diamonds together, so the details will be printed on the certificate about the number of stones and each ones size in carats. Stones are measured in cents and carats. Total weight of gold, platinum or silver, sterling silver or any metal is also written along with the carts, this is very important as diamond stone jewellery usually never comes in 24 Carat ranges and is mostly from 18 to 22 carats. Color of the metal is also mentioned, yellow, white gold, rhodium polish or any other polish over gold. It is important to preserve this certificate of authenticity in case you need to sell, exchange, or make a higher bigger piece of jewellery purchase while giving this piece of diamond stone jewellery. The clarity and carats, cut on the diamond stone helps to bring out the sparkle and the more the sparkle, more the price! Thus bigger the single diamond stone higher the price! For the love of solitaires! Take Care and All the Best from Rizwana ! Oh yes , this sure is very important, I always buy certified diamonds. Thanks Pooja Verma for liking my post!